Frome Rotary mock interview participants. 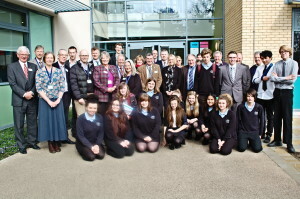 240 students from Year 10 at Frome College took part in a mock interview programme organised by Frome Rotary Club on 11th and 12th March. This is the fifth year of this successful scheme which forms part of the College Work Related Learning Curriculum. It is designed to prepare young people for real interviews for further education or employment by providing them with experience in presenting themselves to adult interviewers, and is supported by a comprehensive handbook provided by the club for the guidance of students, staff and interviewers. The students were interviewed by 40 panels of two interviewers over two days. 60 interviewers took part, representing many local employers, together with individuals representing a variety of careers such as banking, air traffic control, medicine, surveying and many others. Following a 15 minute interview based on an application form they had previously submitted, the students were then invited to discuss with the interview panel what they had gained from the interview and were issued with a certificate as evidence of their experience. The employers supporting the scheme included Asda, Frome Medical Practice, Aggregate Industries, Dairy Crest, Butler Tanner & Dennis, Hanson, CPM Group Ltd, Garston Veterinary Group, Ames Kent, Rogers & Co, Harris & Harris, Silva House Veterinary Group, TBT Ltd, Cooper & Tanner NVB Architects, Taylor Kendall, Steven Lee Consultants, Frome Town Council, Mendip District Council, Bluejay Design, McAllisters, Rossetti House Care Home Frome Chamber of Commerce, Yumble Crumble, Army Careers. Peter Smith, on behalf of the Rotary team said, “Given the current economic climate in the UK it is becoming increasingly difficult for young people to secure jobs. Without the right interviewing skills they are put at a disadvantage. “The object of this scheme is to provide them with contact with employers, some experience in presenting themselves in a real interview environment and encouragement to think about their future.